Peter M. Schlag (born 1948) graduated in medicine from Dusseldorf University in 1973. He completed his surgical training and specialization in Surgery at the University of Ulm. In 1980, he spent a postdoctoral period at the MD Anderson Cancer Center, the NIH, and the Washington Cancer Center, Washington DC. In 1982, he was promoted to the position of C3-Professor and Head of the Section of Surgical Oncology at the Surgical Department of the University of Heidelberg. He was a Visiting Professor at the Roswell-Park-Memorial Cancer Center in Buffalo, NY, 1988. Since 1992, Dr. Schlag has been a full Professor at the Humboldt University Berlin in Germany, heading the Department for Surgery and Surgical Oncology, Charité, Campus Buch. 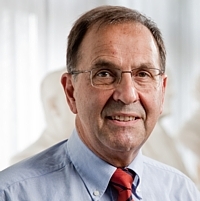 Since 2001, he has been the Medical Director of the Robert-Rössle Cancer Center. Since May 2008, he is director of the Charité Comprehensive Cancer Center. Dr. Schlag has received numerous honors; among them are the Anita and Cuno-Wieland Cancer Prize in 2005 and the Wilhelm-Warner Prize for Cancer Research in 2003. Dr. Schlag is a member of the EORTC Gastrointestinal Cancer Study Group and the EORTC Soft Tissue Sarcoma Study Group. Additionally, he is a member of the Editorial Board of Recent Results in Cancer Research, Journal of Cancer Research and Clinical Oncology, and the Annals of Surgical Oncology.